After two incredible days in Phong Nha it was again time to set our sights on the next destination, the historical city of Hue. We’d met a cool Scottish couple in Hanoi and for the first time we were in the same location so we figured we might as well ride as a squad. As we pulled onto the HCM highway I felt the first few light drops of rain. Pulling over I decided I’d take the opportunity to throw on my rain jacket, but it was of no use. About 30 minutes into the drive the rain was pounding down, to the point where it hurt your knuckles as you rode through it. With a pair of khaki pants, a sweater, and a rain coat I was completely soaked through to my boxers – but just in case the weather wasn’t certain if I was soaked or not we drove through a puddle that literally submerged my feet. There was really nothing we could do at this point but press on and hope that any electronics we had were packed up and sealed shut. It’s about a 230km jaunt down the Ho Chi Minh Highway and across to the A1 highway to Hue, and we were prepared to do whatever it took. With the trusty help of Google Maps provided by our new friends we weren’t going to be getting lost again. We even decided to check out the Vinh Moc Tunnels as a rest stop on our journey. 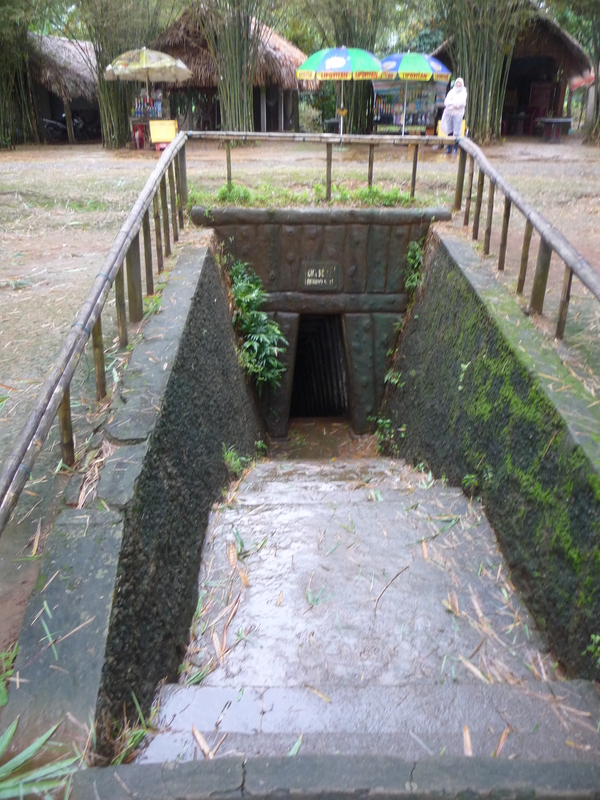 Vinh Moc Tunnels were formed during the American War; essentially an underground city built to shelter people from the intense bombing of Song Trung and Son Ha communes. The original tunnels were 10m deep, however the US military designed bombs to reach a depth of 10m so they eventually burrowed to depths of 30m. They’re quite amazing to walk through, and definitely difficult if you’re taller than 5’6”. You might even by guided by a local man who was born in the tunnels even though you never requested his help, he’s harmless, deaf, and speaks no English, but he’s quite a hilarious character to have around. 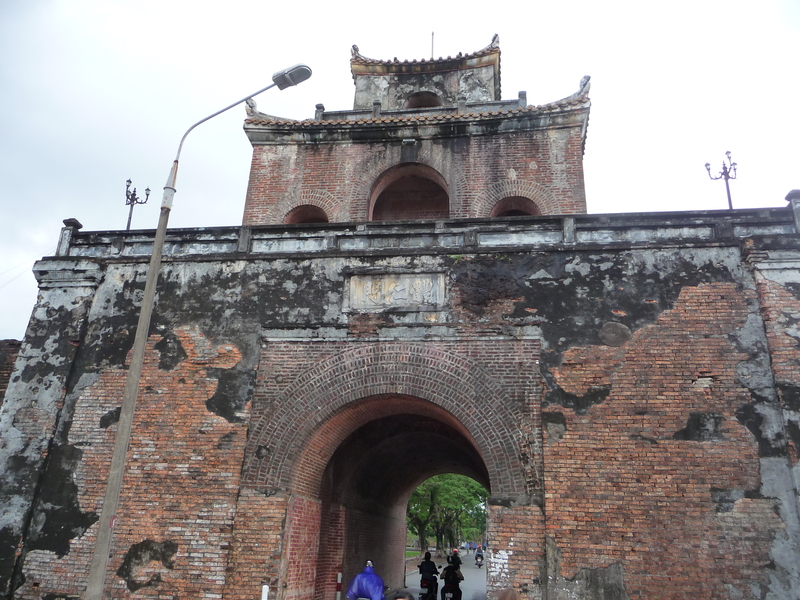 After driving the last 100km in the dark and through another rain storm, we drove under the imperial archway and turned onto the main hostel strip in Hue. We were soaked, freezing, and hungry so we just took the first place we saw – the DMZ Hotel. It was a little pricey at $15/night, but it came with breakfast, had hot water, and was in the right spot. After a few drinks and some pizza (yeah we splurged) we hit the pillow and got a solid rest. My day plan for Hue was relatively simple. My motorcycle had again begun to have more problems, producing a “frog-like” sound at the bottom of all my gears. To be honest, I was a little sick of always stopping so I went to my mechanics partner in Hue and told him to take it for a spin, give me an honest assessment, and just fix anything that is and might go wrong. The quote was for 550,000 ($27), this included a new clutch, new front & rear brakes, a cleaned carburetor, re-welded exhaust, full check, a new generator, and some new cables – I was a little upset that so much was needed, but I just wanted to not have to pull over every day with a new problem, so I agreed. Hue is certainly a city of historical significance, and you can simply spend your day walking around the streets, checking out the many Pagoda’s, or going to check out the Imperial Enclosure. 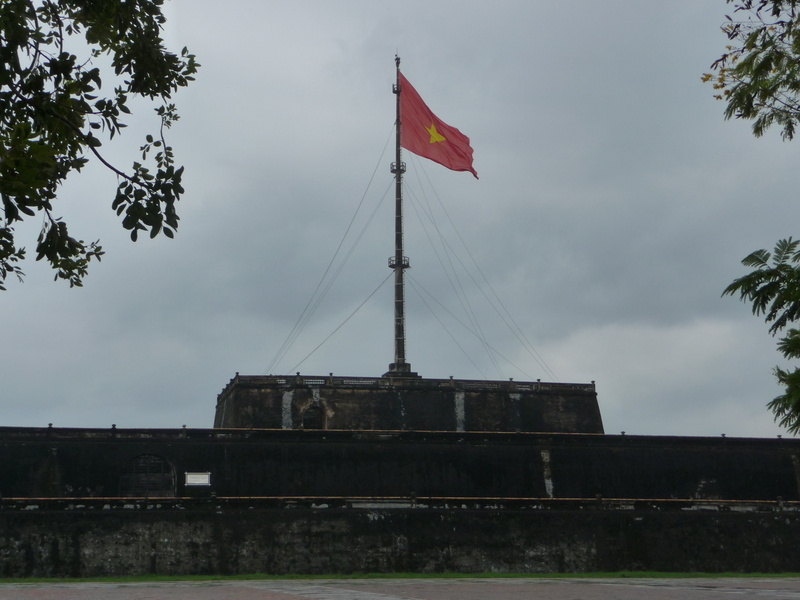 The Enclosure or Imperial City is a walled fortress and Palace in Vietnam’s former capital. It did have some impressive sights, but I’ve never been a huge history buff and unless there are information boards detailing the historical significance of these buildings, simply walking through them just didn’t cut it for me. It’s a beautiful city, and for some I’m sure it’s fascinating, but after a day I knew it was time to continue on to drive the legendary Hai Van Pass to Hoi An. Hue turned out to be a rest stop, and a mechanic stop, but for me it could easily be passed over on any motorcycle tour.